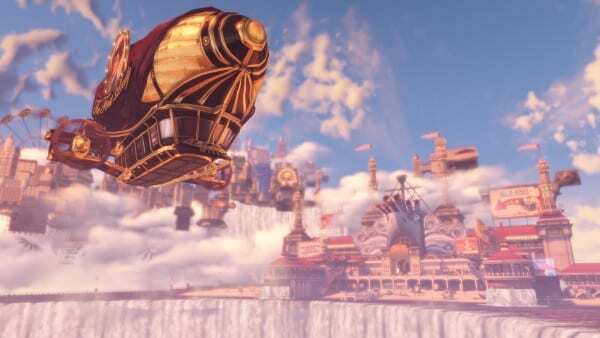 With the release of Apex Legend’s new battle pass, there are over 100 new items for players to get throughout Season 1: Wild Frontier. 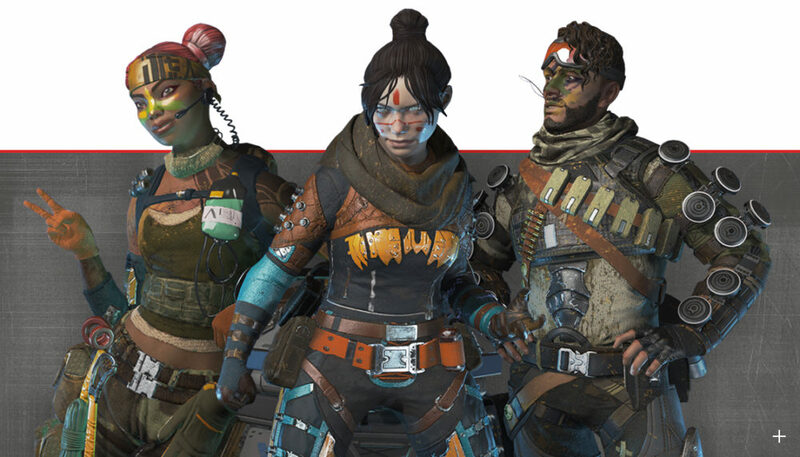 Here are all the Apex Legends Wild Frontier Battle Pass rewards. Five Apex packs (at level 2, 12, 24, 34, and 46). 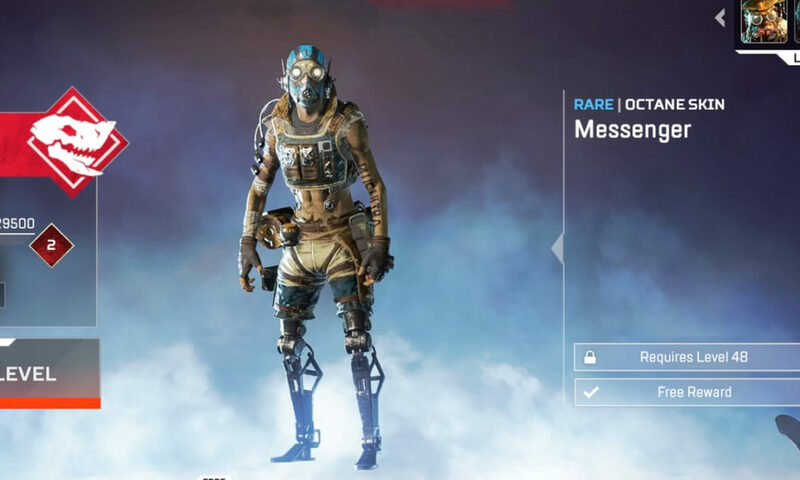 A Rare Octane skin, Messenger (at level 48). 18 Wild Frontier Stat Trackers (Included randomly between levels 4-44). To know exactly what you get at each level, here are all the Season 1: Wild Frontier battle pass rewards starting at level one. 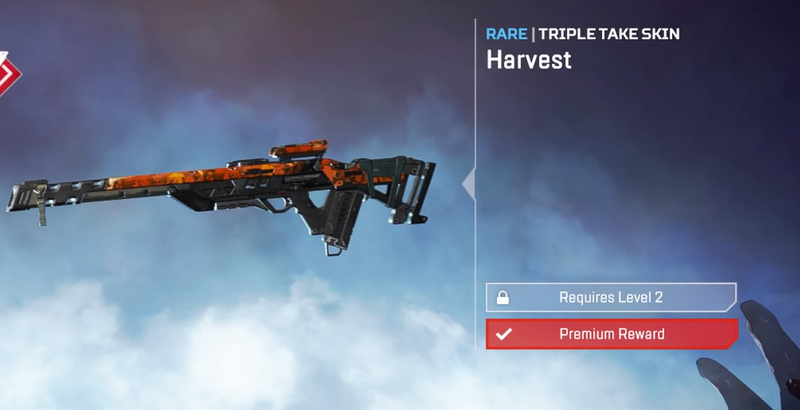 Level 1: Three rare skins for Lifeline (Revolutionary), Wraith (Survivor), and Mirage (Outlaw). 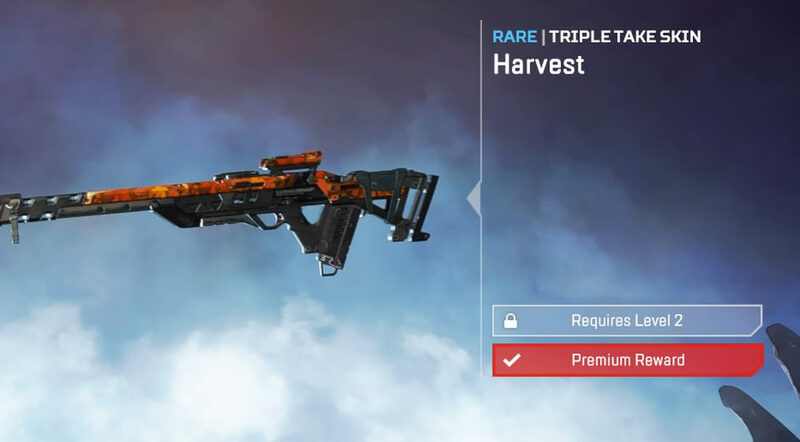 Level 2: Rare Triple Take skin, Harvest and rare Apex pack. Level 3: Wraith ‘Season 1 Kills’ Tracker. Tier 4: Rare Hemlok skin, Patchwork and Gibraltar ‘Season 1 Wins’ Tracker. Level 5: Season 1 badge. Level 6: Bangalore intro quip ‘Opening season. No time for an FNG” and Pathfinder ‘Season 1 Wins’ Tracker. Level 7: 50 Apex coins. Level 8: Bloodhound ‘Season 1 Kills’ Tracker and Wraith ‘Season 1 Wins’ Tracker. 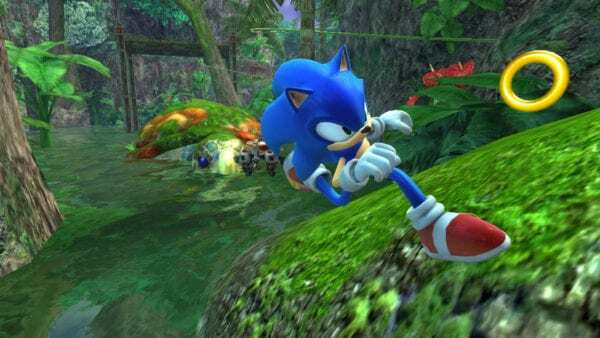 Level 9: Rare Prowler skin, Navigator. Level 10: Season 1 badge and Bangalore ‘Season 1 Wins’ Tracker. Level 11: 50 Apex coins. Level 12: Epic BP Point Boost (+5% of Survival Time awarded as bonus Battle Pass points per party member in squad) and rare Apex pack. 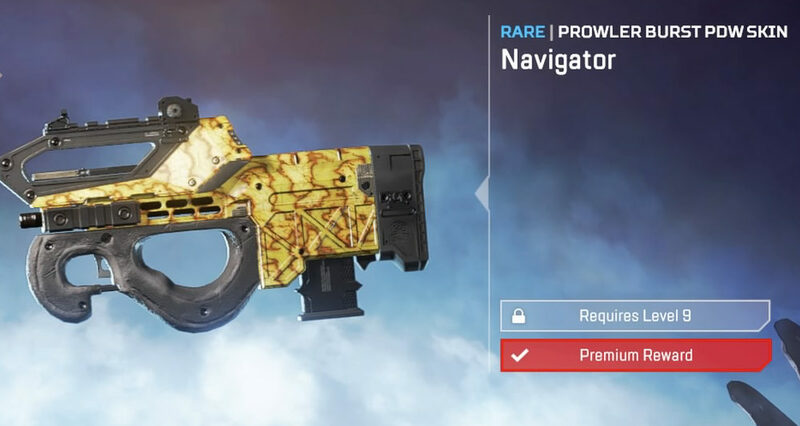 Level 13: Rare Mirage frame, Funny Bones. 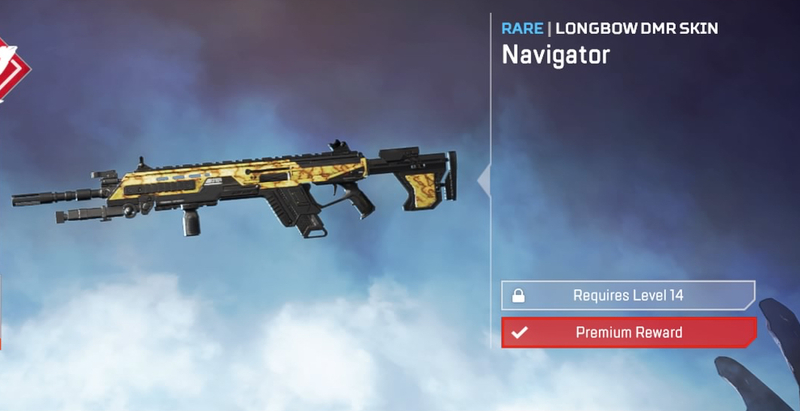 Level 14: Rare Longbow skin, Navigator and Bloodhound ‘Season 1 Wins’ Tracker. Level 15: Season 1 badge. Level 16: Mirage intro quip “It’s opening season, gotta love it…” and Caustic ‘Season 1 Wins’ Tracker. Level 17: 50 Apex coins. Level 18: Rare Octane frame, Flight Risk and Mirage ‘Season 1 Wins’ Tracker. 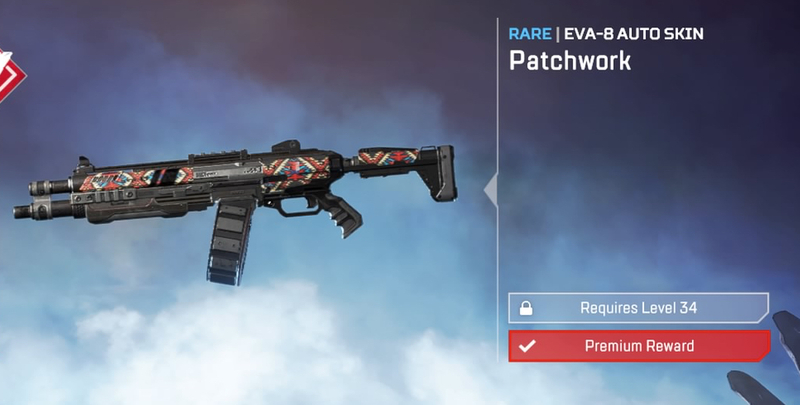 Level 19: Rare Spitfire skin, Patchwork. Level 20: Season 1 badge and Lifeline ‘Season 1 Wins’ Tracker. Level 21: 50 Apex coins. Level 22: Epic BP Point Boost (+5% of Survival Time awarded as bonus Battle Pass points per party member in squad) and Octane ‘Season 1 Wins’ Tracker. Level 23: Rare Wraith frame, Silk Road. 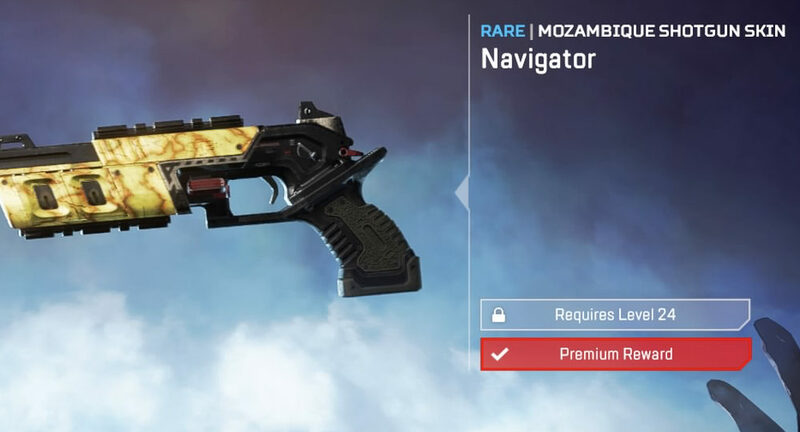 Level 24: Rare Mozambique skin, Navigator and rare Apex pack. Level 25: Season 1 badge. 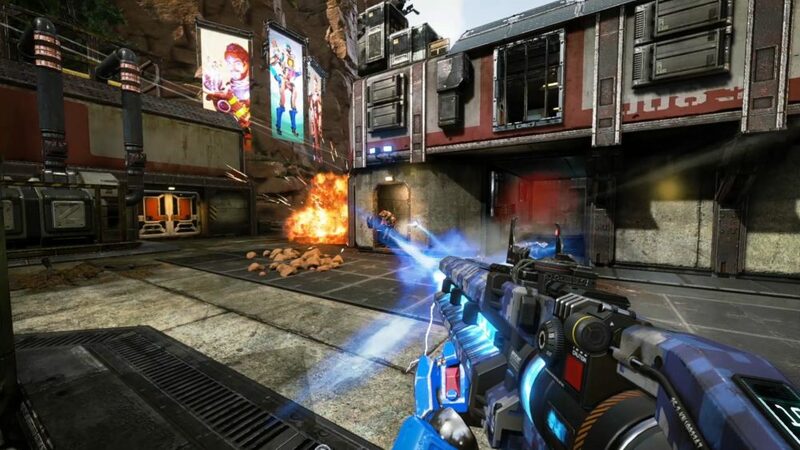 Level 26: Epic Apex pack and Caustic ‘Season 1 Damage Done’ Tracker. Level 27: Pathfinder intro quip, “It’s the season opening”. Level 28: Mirage ‘Season 1 Kills’ Tracker and Bangalore ‘Season 1 Damage Done’ Tracker. 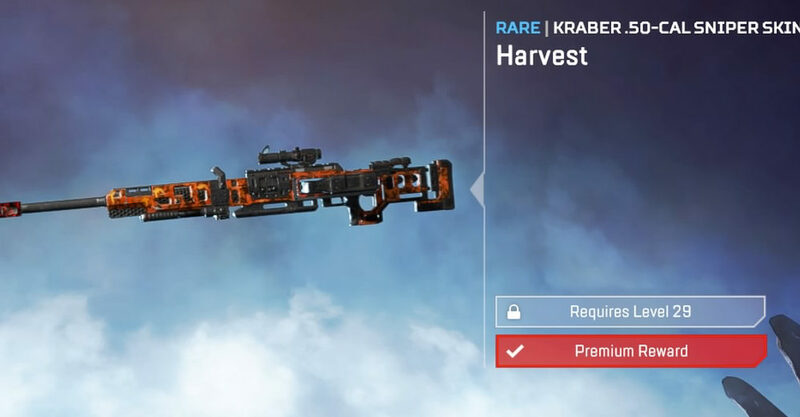 Level 29: Rare Kraber skin, Harvest. Level 30: Season 1 badge and Gibraltar ‘Season 1 Damage Done’ Tracker. Level 31: 50 Apex coins. Level 32: Epic BP Point Boost (+5% of Survival Time awarded as bonus Battle Pass points per party member in squad) and Bloodhound ‘Season 1 Damage Done’ Tracker. Level 33: Pathfinder ‘Season 1 Kills’ Tracker. 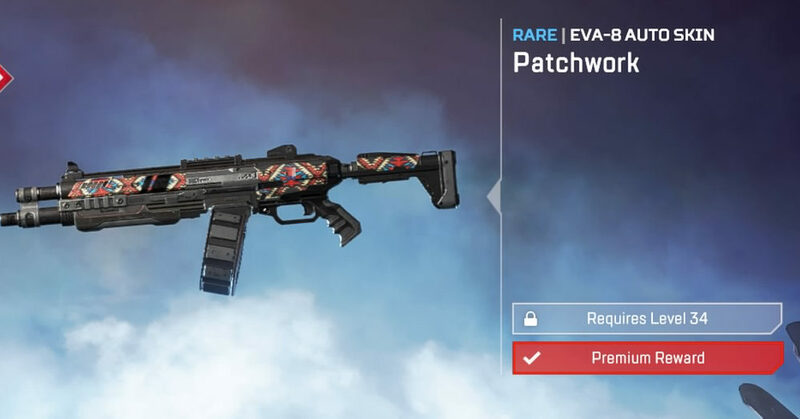 Level 34: Rare Eva-8 skin, Patchwork and rare apex pack. Level 35: Season 1 badge. Level 36: Caustic intro quip, “Opening season. Very well” and Lifeline ‘Season 1 Damage Done’ Tracker. Level 37: 50 Apex coins. Level 38: Caustic ‘Season 1 Kills’ Tracker and Octane ‘Season 1 Damage Done’ Tracker. 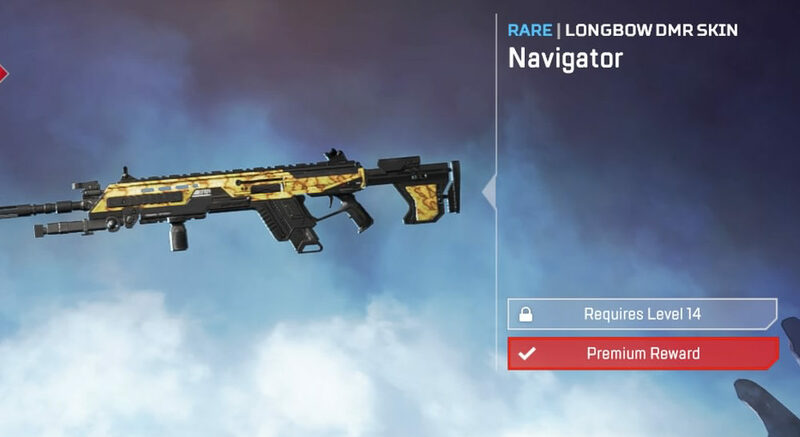 Level 39: Rare Flatline skin, Navigator. Level 40: Season 1 badge and Wraith ‘Season 1 Damage Done’ Tracker. Level 41: 50 Apex coins. Level 42: Epic BP Point Boost (+5% of Survival Time awarded as bonus Battle Pass points per party member in squad) and Mirage ‘Season 1 Damage Done’ Tracker. 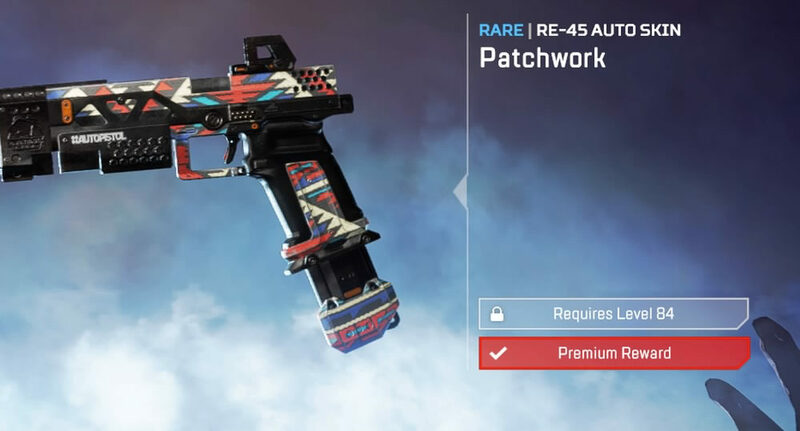 Level 43: Rare Apex pack. 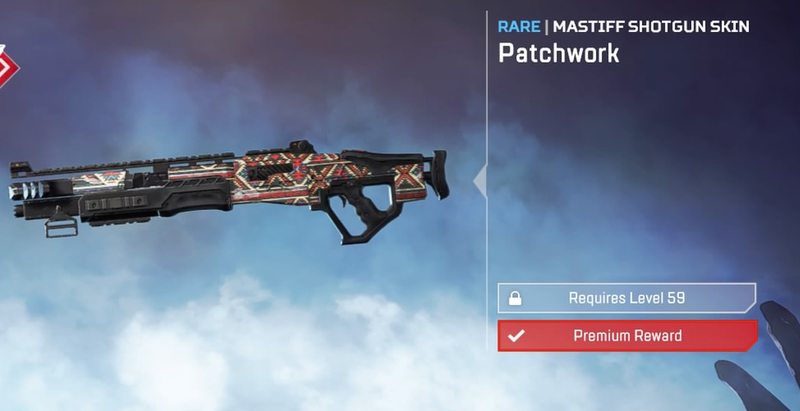 Level 44: Rare Alternator skin, Patchwork and Pathfinder ‘Season 1 Damage Done’ Tracker. Level 45: Season 1 badge. 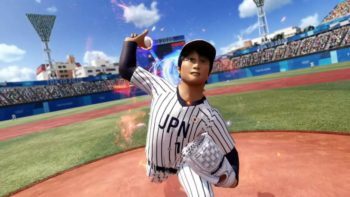 Level 46: Gibraltar intro quip “It’s opening season” and rare Apex pack. Level 47: 50 Apex coins. 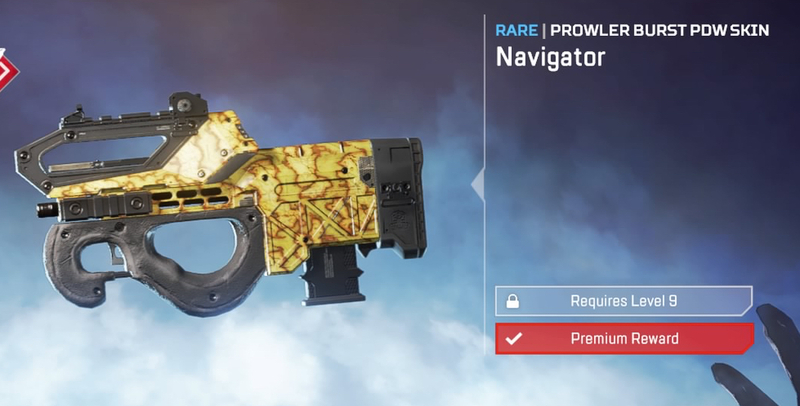 Level 48: Gibraltar ‘Season 1 Kills’ Tracker and rare Octane skin, Messenger. 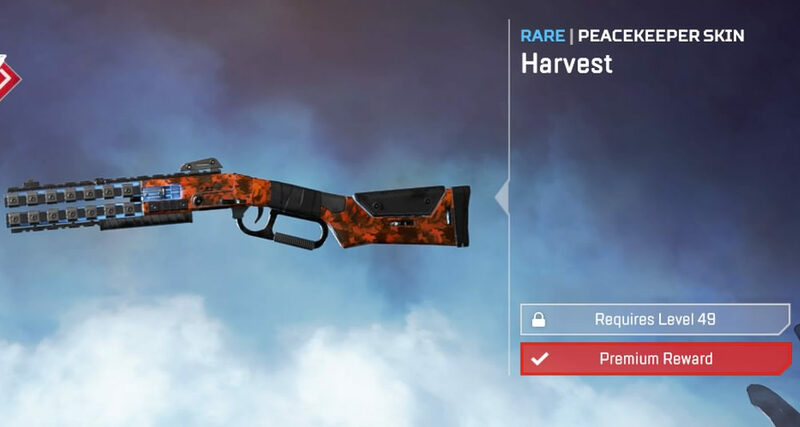 Level 49: Rare Peacekeeper skin, Harvest. Level 50: Season 1 badge. 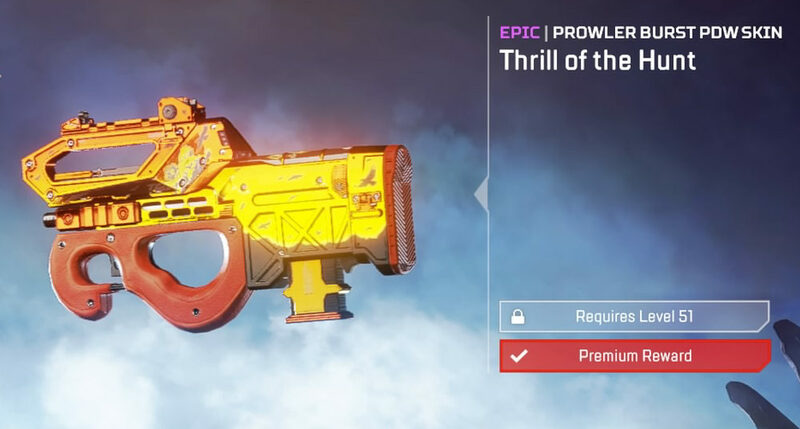 Level 51: Epic Prowler skin, Thrill of the Hunt. Level 52: Epic BP Point Boost (+5% of Survival Time awarded as bonus Battle Pass points per party member in squad). 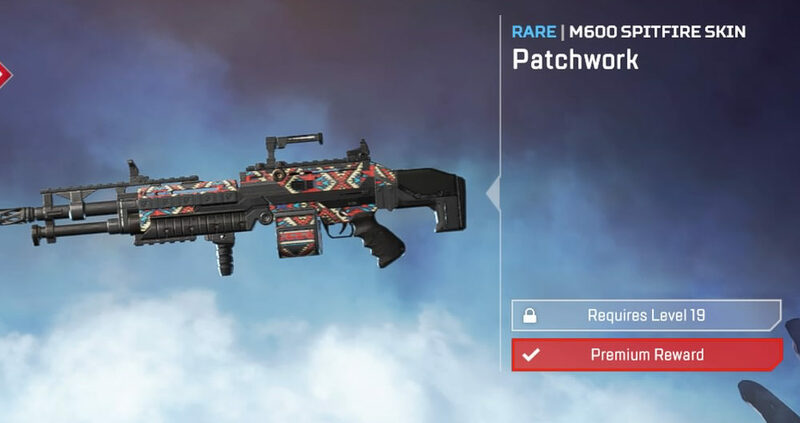 Level 53: Rare Apex pack. 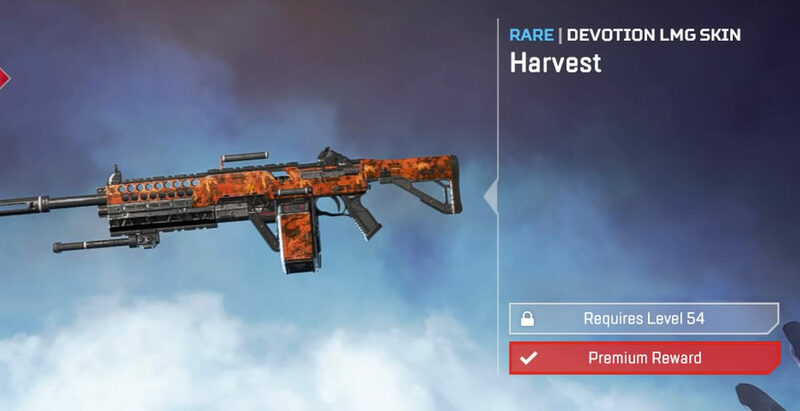 Level 54: Rare Devotion skin, Harvest. Level 55: Season 1 badge. Level 56: Wraith intro quip, “It’s opening season. Our path is set…”. Level 57: 100 Apex coins. Level 58: Octane ‘Season 1 Kills’ Tracker. 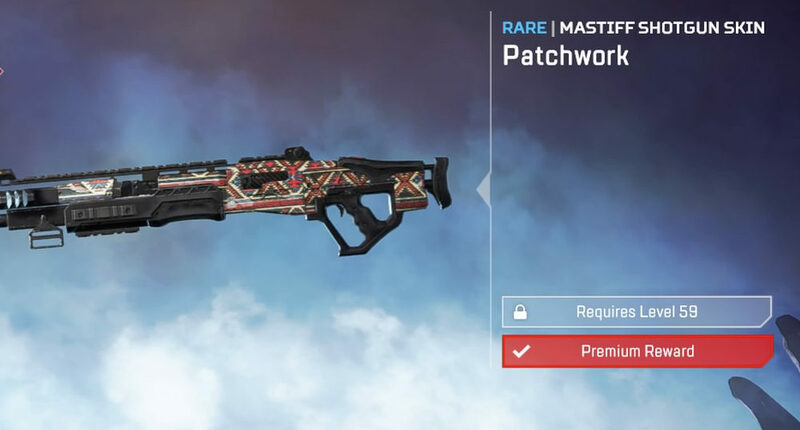 Level 59: Rare Mastiff skin, Patchwork. Level 60: Season 1 badge. Level 61: Rare Lifeline frame, Pick Me Up. Level 62: Epic BP Point Boost (+5% of Survival Time awarded as bonus Battle Pass points per party member in squad). Level 63: 100 Apex coins. 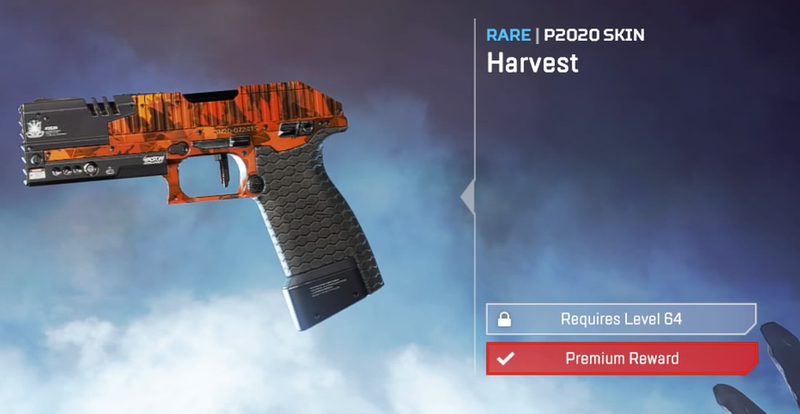 Level 64: Rare P2020 skin, Harvest. Level 65: Season 1 badge. Level 67: 100 Apex coins. Level 68: Lifeline ‘Season 1 Kills’ Tracker. 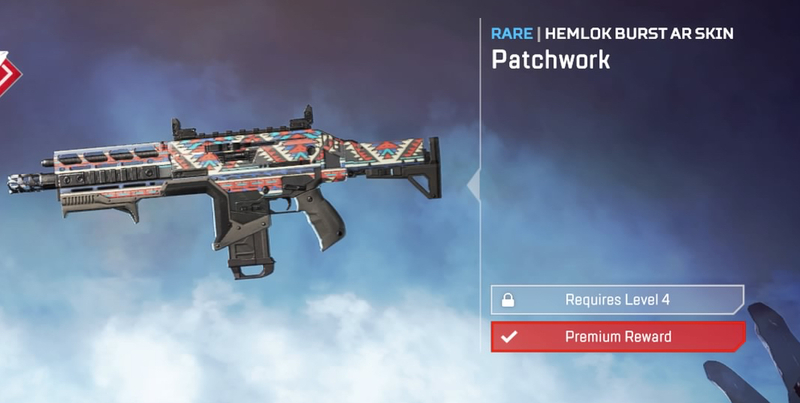 Level 69: Rare Havoc skin, Patchwork. Level 70: Season 1 badge. Level 71: Rare Bloodhound frame, Nock Down. Level 72: Epic BP Point Boost (+5% of Survival Time awarded as bonus Battle Pass points per party member in squad). 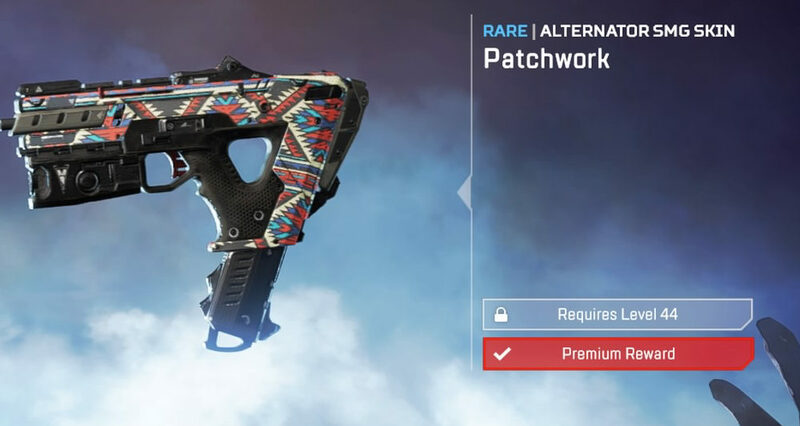 Level 73: Rare Apex pack. 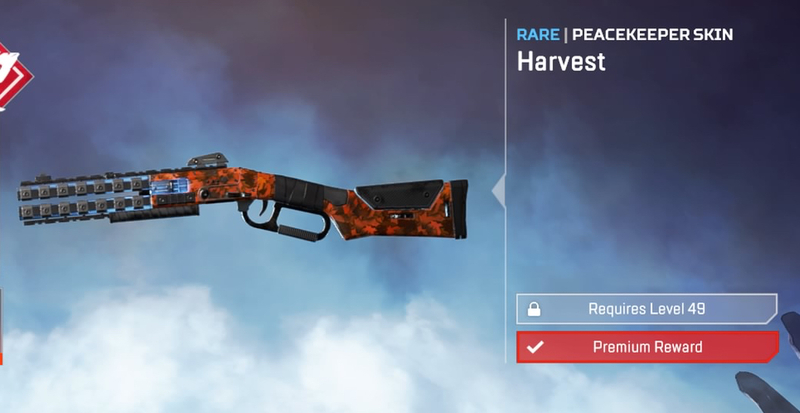 Level 74: Rare R-99 skin, Harvest. Level 75: Season 1 badge. Level 76: Octane intro quip “Season’s open amigos”. Level 77: 100 Apex coins. Level 78: Bangalore ‘Season 1 Kills’ Tracker. 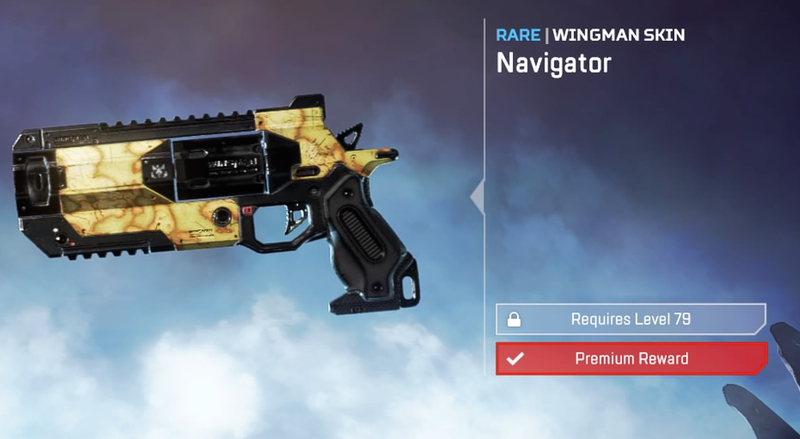 Level 79: Rare Wingman skin, Navigator. Level 80: Season 1 badge. Level 81: Rare Gibraltar frame, Land of Giants. Level 82: Epic BP Point Boost (+5% of Survival Time awarded as bonus Battle Pass points per party member in squad). 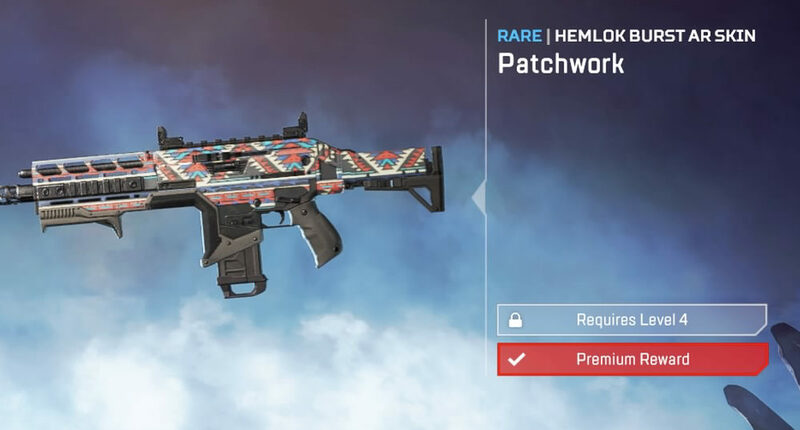 Level 83: Rare Apex pack. 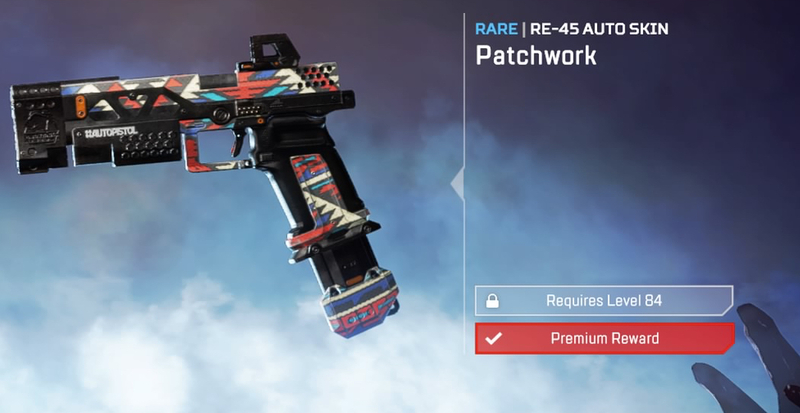 Level 84: Rare RE-45 skin, Patchwork. Level 85: Season 1 badge. Level 86: Legendary Apex pack. Level 87: 100 Apex coins. Level 88: Rare Caustic frame, Slaughterhouse. Level 89: Epic BP Point Boost (+5% of Survival Time awarded as bonus Battle Pass points per party member in squad). Level 90: Season 1 badge. Level 91: Rare Pathfinder frame, Building Bridges. Level 92: Epic BP Point Boost (+5% of Survival Time awarded as bonus Battle Pass points per party member in squad). 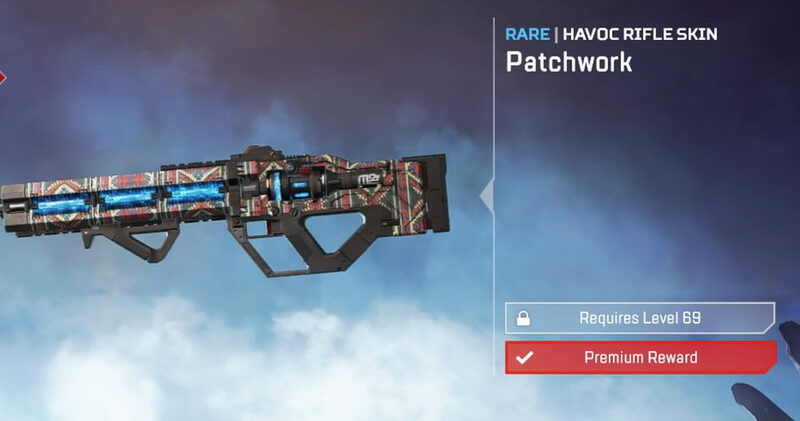 Level 93: Rare Apex pack. 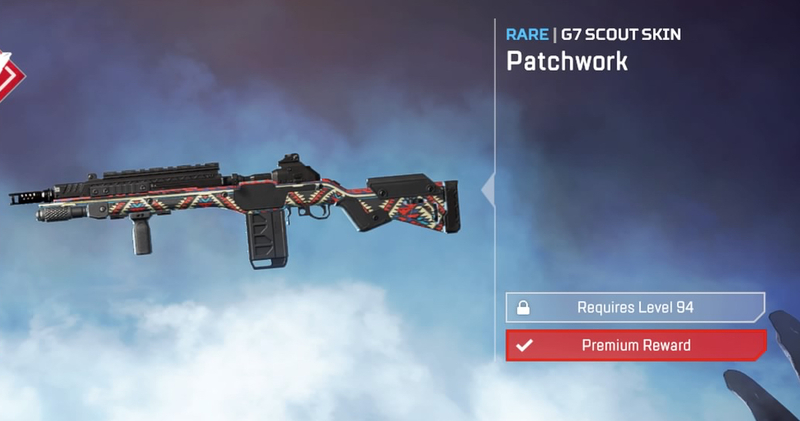 Level 94: Rare G7 Scout skin, Patchwork. Level 95: Season 1 badge. 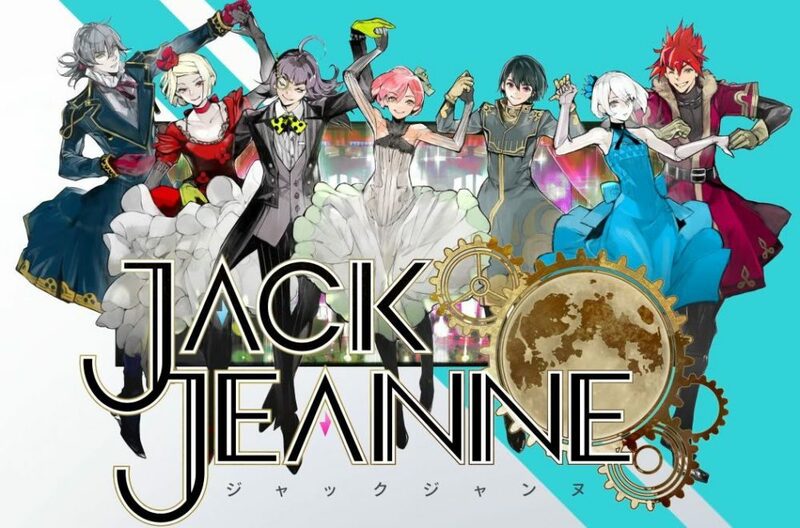 Level 96: Lifeline intro quip, “Open season. Let’s go”. Level 97: 100 Apex coins. Level 98: Rare Bangalore frame, Sharpened Senses. 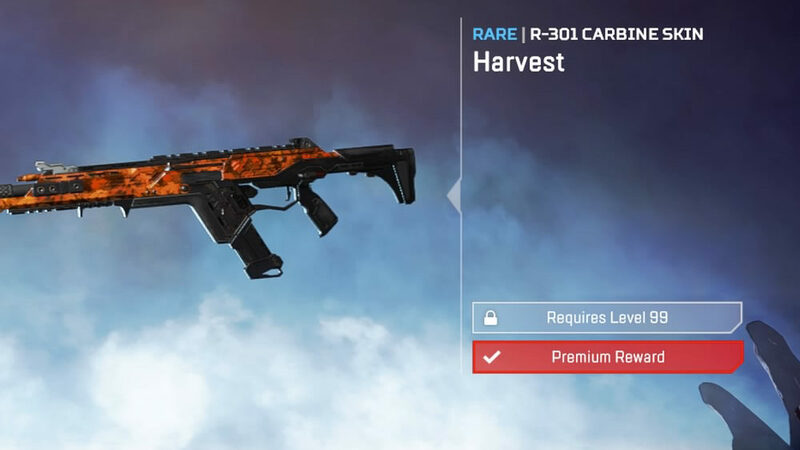 Level 99: Rare R-301 skin, Harvest. 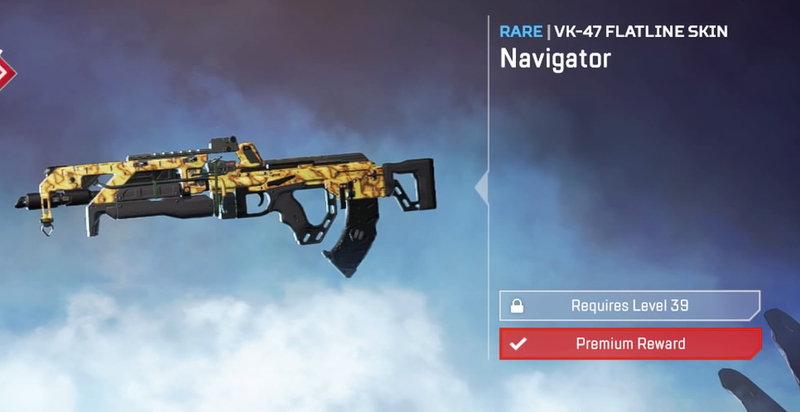 Level 100: 100 animated Season 1 badge and Legendary Havoc skin, The Silver Storm. 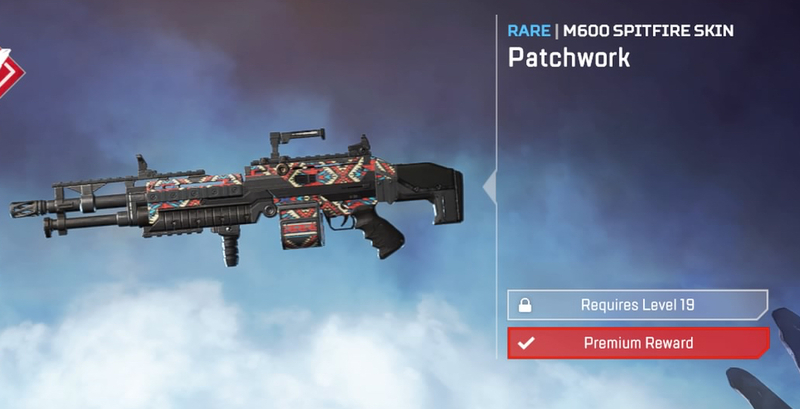 Skin has upgraded weapon effects after one, two, and five kills in a single match. 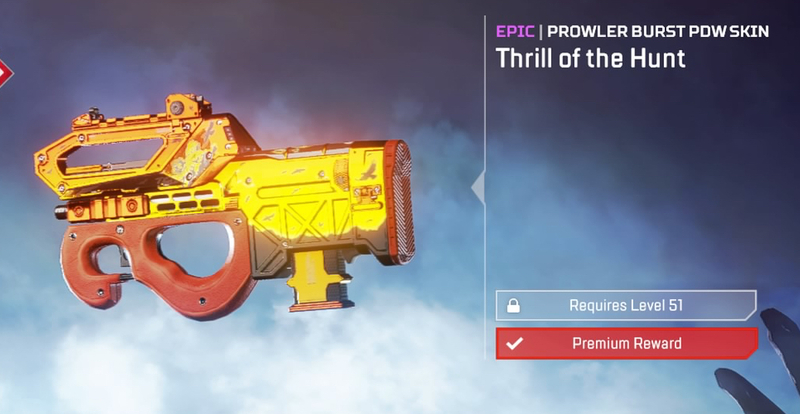 Level 110 (Bonus): Wild Frontier skull logo animated Season 1 badge, and Legendary Havoc skin, The Golden Idol. This skin also has upgraded weapon effects after one, two, and five kills in a single match. 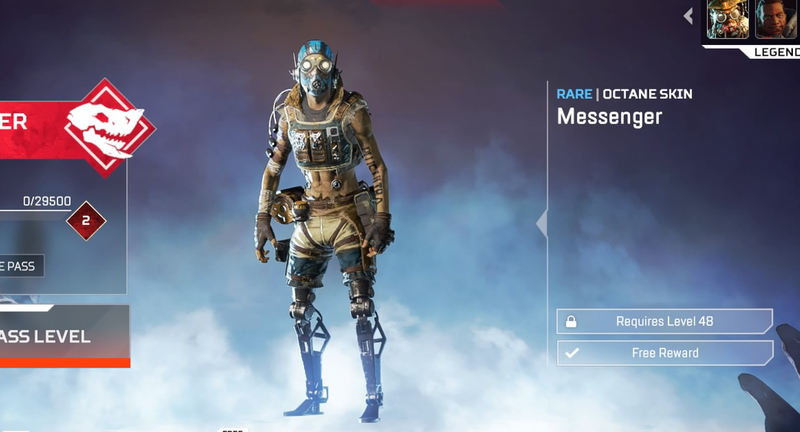 And there you have it, all of the Season 1: Wild Frontier battle pass rewards for Apex Legends. For more tips and tricks on the game, be sure to search for Twinfinite. 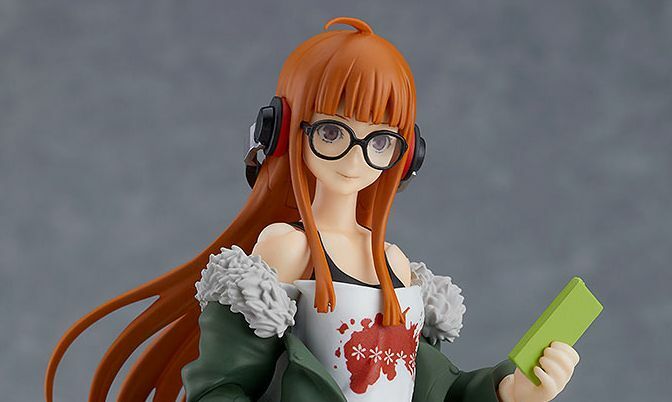 We’ve listed a few other helpful guides down below.